Microsoft appears to have updated Windows Update Troubleshooter to fix Windows 8.1 Update 0x80070002 and 0x80070003 errors in Windows 8.1. Yesterday, Microsoft updated its Knowledge Base article to explain that Windows Update may still again offer you the Windows 8.1 Update KB2919355 package, even if you had installed it earlier, and why you should install this package again. Today, it appears to have updated Windows Update Troubleshooter to be able to automatically fix Windows Update errors 0x80070002, 0x80070003, which many users have been facing while installing Windows 8.1 Update. This has been explained in the updated KB article. Windows 8.1 Update package KB2919355 introduces several new features. You will need to install this update in order to receive all future updates. But many Windows 8.1 users have been reporting that Windows 8.1 Update fails to install on their Windows 8.1 computers. 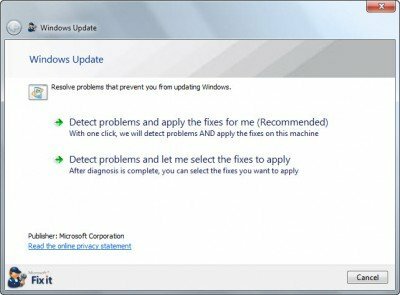 The Windows Update Troubleshooter will run and attempt to identify any problems which may be preventing your Windows computer from downloading and installing Windows Updates. If your Windows 8.1 Update has failed to installed, do try running this updated troubleshooter and see if it helps.